The Fisher Scientific Isotemp Undercounter Freezer comes from one of the most trusted and globally recognized brands. This convenient to place general purpose freezer has a capacity of 4.3 cu ft., an adjustable temperature range of -12 to -20°C and uses a CFC free refrigerant. The exterior is coated in a baked on acrylic enamel, and the vacuum-formed interior is a seamless and easy to clean freezer-grade plastic over sprayed in place polyurethane foam. For optimal performance a clearance area of 4 inches on the top and back, and a 1 inch clearance on the sides of this lab freezer should be observed. 15 x 18 x 28 in. 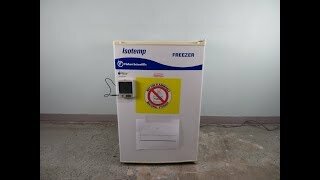 This Fisher Isotmper Undercounter Freezer has been tested and performed as expected. All of our lab equipment comes backed with our standard warranty. Should you have any questions, please don't hesitate to contact us.